The course comes with 3 DVDs (3 hours video lessons) and one 80 pages binder. The downloadable version is available. It is suitable for intermediate players and above. Playing piano and accompanying yourself or others while singing can be so enjoyable, relaxing, and it's fun too! However, there are times when piano players do not know what to play while the singer is singing the melody. If you have basic playing experience, and are interested in learning some great techniques on accompaniment, then this is the course for you! Now You Too Can Be A Better Piano Accompanist! 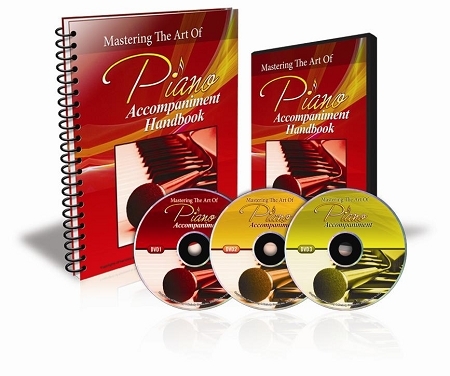 This new piano DVD course reveals the techniques commonly used by professional accompanist. The techniques can be applied to contemporary worship music including gospel music. Piano Pedals Techniques - This will help you understand the three pedals on the piano and how to use each one correctly. If you have a beautiful, or very good voice; or you want to accompany somebody or a choir in the church; according to me, Yoke’s accompaniment course is the best. For example, I listened to the pianist in my church; he played & sang by himself the same style with all the hymns from the beginning until the end of the Sunday Mass. To tell the truth, I have to endure his music every time he plays. In Yoke’s accompaniment course, she shows us different styles with other techniques that make your music more joyful & interesting. I always thank God for Yoke’s marvelous products. I am presently taking the accompaniment course, and am learning so much. This is the second course I have taken, and plan to take more. Thanks so much! Steve B. Your "Mastering The Art of Piano Accompaniment and Definitive Piano Improvisation" are the two most valuable piano instructions that I ever have in my life. I have no doubt that I 'definitively' made a progress in just a week time. Your unlimited ideas have enriched my skills in piano and most importantly you have allowed me to explore or open up to many other ideas . Your DVD's are easy, fun and enjoyable to watch. I wish I had these dvd's when I started learning how to play the piano from scratch with no formal piano lessons. I am a 34 years old working mom with two little girls. I also have no knowledge on music one and half year ago. But I started learning piano from then. Now I can accompany people in the church for over 80 different songs. (include C, G, D, A, E, F, B flat, E flat major scale and Am, Bm, Cm, Dm, Em, Gm minor scale). I can make the formula between all the 12 major scale and 12 minor scale. I also can arrange chord by myself. I can do left hand with chord right hand with melody or both hands with chord. Your class help me so much recently.